Stitched together using a bright and beautiful cushy yarn with a Spring vibe. I was inspired by the seasons change coming soon and the brightness of Ostara. The pictures don’t do the colors justice! The yarn is a 70% Superwash wool and 30% nylon blend which gives it a more natural texture with a little stretch. I made it directly against one of my own decks that seems to be a common standard size. Wrap this around your deck as a nice barrier in your bag, drawer, etc. I made the wrap string fairly long to fit another similarly sized deck if you choose to use one. The box used to measure the bag is shown in pictures as an example. The box itself measures 2.8 x 1.2 x 4.8 inches. 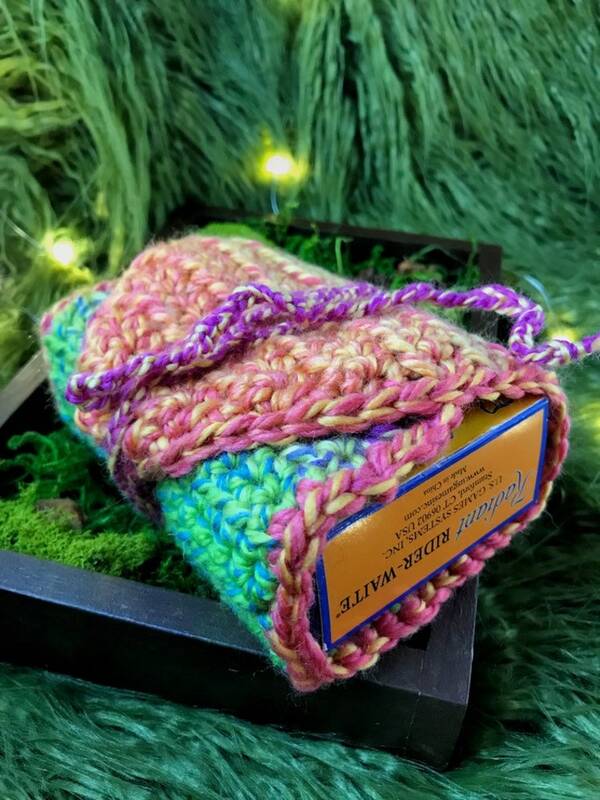 The wrap itself measures approximately 5 1/4 inches wide and 12 inches long with a 3 foot long wrap string. This listing DOES NOT include the props, tarot deck, etc. You will ONLY receive the crocheted tarot wrap.